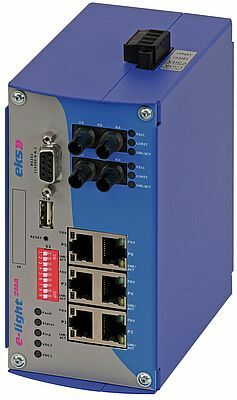 The Industrial Ethernet Switch from the e-light 2MA-family by eks Engel fulfills the requirements of the Profinet conformance class B. Thus it can be fully integrated into automation systems such as TIA (Totally Integrated Automation) or CODESYS. Since the switch supports LLDP (Link Layer Discovery Protocol) it is automatically recognized by the programmable logic controllers and can be comfortably integrated into the automation system via GSDML files (General Station Description Markup Language) just as I/O devices. Besides six twisted pair ports (10/100 BASE-TX), two optical uplinks (100BASE-FX) are also available with which distances of up to 30 km can be bridged depending on the optical fiber type. Redundancy mechanisms such as MRP (Media Redundancy Protocol) enable high-availability ring topologies with a reconfiguration time of 200 ms and less. The switch can be configured either via the Profinet controller, SNMP (Simple Network Management Protocol) or web browser. The diagnostics functions can be linked with alarms that are displayed via SNMP, e-mail or relay. Interfaces for USB sticks and SD cards can be used for backups and software updates. Other features of the switch, which is available for different optical fiber types and connection technologies, include a temperature range of -40°C to +70° C, a redundant power supply (12-70 VDC) and a powder-coated stainless steel housing (145 x 70 x 130 mm ) for DIN rail mounting.